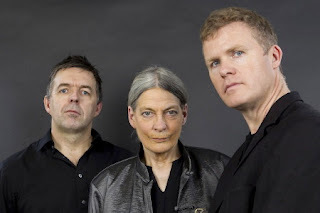 2011 proved, even by her high standards, a terrific year for June Tabor, one bookended by the release of two of her finest-ever recordings: the exquisite, sea-themed Ashore (review here) and her long-anticipated second collaboration with Oysterband, Ragged Kingdom (review here). The latter deservedly scooped Best Album at the BBC Folk Awards in 2012 and Tabor was – just as deservingly – once again named Folk Singer of the Year at the same ceremony. The momentum generated by those two great releases has seen Tabor sign up for lengthier-than-usual touring duties in the past couple of years, and prove her ability to rock out with the best of them in her thrilling gigs with the Oysters across the UK. 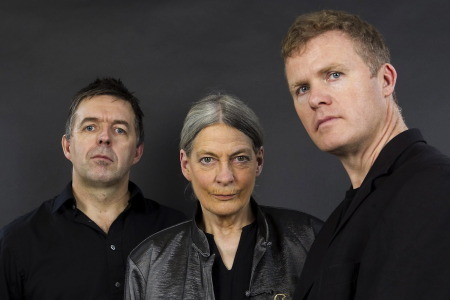 The performances on Tabor’s latest release actually predate her reunion with John Jones and co, though, and find her in more customarily minimalist – though no less commanding – mode. 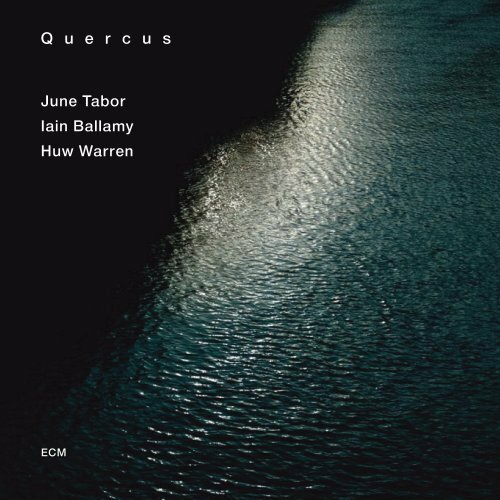 Quercus (Latin for “oak”) is a trio made up of Tabor, her longtime pianist/arranger Huw Warren and saxophonist/composer and Food co-founder Iain Ballamy (who featured on Tabor’s 2005 album At the Wood’s Heart). The group undertook a series of concerts in this format in early 2006, and the new release draws from one of those shows, presenting performances from a gig at the Anvil in Basingstoke. Not that you’d necessarily identify this as a concert recording just from listening to the CD. 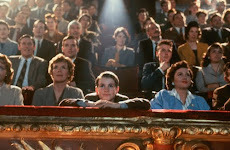 For, as on Tabor’s 1997 classic aleyn, the sounds of the audience have been removed (the occasional light cough notwithstanding) to prevent distractions and to place the focus firmly on the performances. The result is a wonderfully fruitful and distinctive collaboration. Stylistically, Quercus finds June at the jazziest she’s been since 1999’s A Quiet Eye (her album with the Creative Jazz Orchestra) - or maybe even since 1989’s album of standards, Some Other Time. (That's a record that someone really should get around to reissuing soon, by the way.) Jazz, of course, has informed her singular “chamber folk” approach ever since she hooked up with Warren in the late 1980s. But, accompanied solely by his piano and Ballamy’s tenor and soprano saxophones, the influence is at its most unmistakable here. That said, the album’s sound isn’t, at first hearing, wildly dissimilar to the kind of aesthetic that the singer's honed over the past 25 years, while the material – drawing on poems, standards, Ballads and (Les) Barkers – tackles treasured Tabor topics: war, death, Love Gone Wrong. But subtle distinctions do emerge, for the trio’s approach, with its compelling mixture of precision and improvisation, fleshes the songs out into little suites that produce a range of fresh textures, often edging into classical terrain. (In addition, there’s also a higher-than-usual proportion of songs focusing on Love Gone Right here, but more about those anon). There is, throughout, a subtle sense of experimentation and exploration to the endeavour. By turns delicate, grave, and brimming with passion, Warren’s piano-work has seldom been more luscious, or more orchestral in its range and breadth, while, brought to the forefront, Ballamy’s saxophone-playing proves a simply stunning complement to Tabor’s inimitable dusky contralto, with its breathtaking control and remarkable dramatic power. Thoughtfully structured, the album opens where At The Wood’s Heart closed: with a velvety rendering of “Lassie Lie Near Me” that - even more overtly than the album version - transplants Robbie Burns’s anthem of seduction from a familiar pastoral setting into a smoky jazz dive. The traditional “As I Roved Out” is exquisitely restrained and quietly devastating, with precise piano, plaintive sax and a shudderingly intense yet dreamy vocal cutting right to the heart of this classic of thwarted love. Ballamy and Warren’s instruments dance nimbly through both Barker’s “Who Wants the Evening Rose?” and George Butterworth’s setting of A.E. Housman’s “The Lads in their Hundreds,” the latter suggesting youthful innocence about to be swept aside by the turmoil and horror of war. Following it, Warren’s John Dowland-inspired instrumental “Teares” is a thing of aching, shimmering beauty whose title names the emotional response that the piece both evokes and provokes, cleansing the listener. A gorgeously extended take on Mack Gordon and Harry Warren’s “This Is Always” suits the song’s celebration of enduring love. And it’s doubtful that the year will yield a more warmly, maturely romantic track than the closing rendition of “All I Ask of You,” Barker’s spare adaptation of Gregory Norbet’s text stretched to a glorious, embracing eight minutes. In contrast, Tabor takes “Brigg Fair” solo in one of her rivetingly direct a cappella performances that make it feel like the whole world just stopped in deference. A few tracks require – and reward – more work from the listener. The trio’s coal-black take on Feste’s “Come Away Death” from Twelfth Night sounds forbiddingly austere on a first listen, but gradually reveals itself to be a deeply humane and soulful performance, as Tabor and Ballamy's tight "duet" gives way to spirited riffing when Warren joins in. Billowy sax and wintery piano float around the image-rich floating verses of “Near But Far Away” in a reading that’s full of misty ambience. The track I’ve found myself returning to most, though, is David Ballantine’s deeply mysterious “A Tale From History (The Shooting)”. I’m not sure to what event the song alludes, specifically. But shifting from delicate, wistful verses to seething, impassioned choruses, the trio’s interpretation conjures a vivid sense of sudden violence intruding into everyday routine that feels all but timeless, and that cuts bone-deep. Rich and resonant, inhabited with soul-stirring skill by seasoned performers, the songs here are all “tales from history” that connect with the listener in this direct way, and that captivate with the intensity, grace and depth of feeling with which they are delivered. Quercus are currently touring. Further information here. Oh, I love June Tabor. Judging from the Quercus link you gave, this album and tour are absolutely unmissable.